Photo of Margaret Bourke-White, the first female war correspondent and LIFE photographer, shown here on assignment covering cavalry and artillery on the Italian front during action in WWII, 1944. 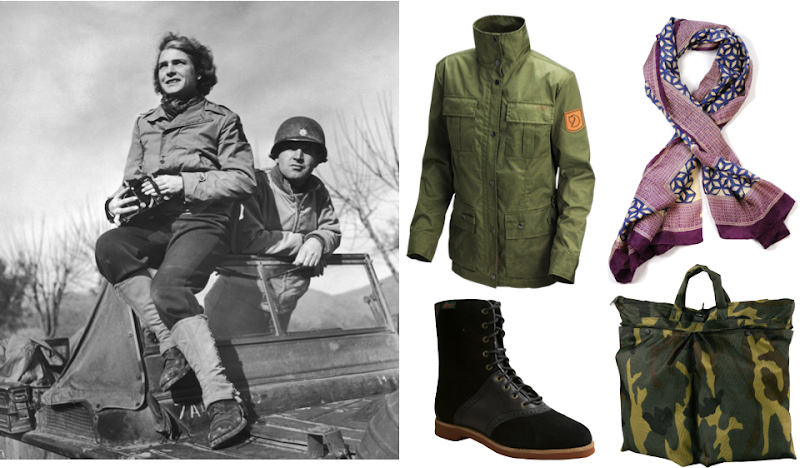 Fjallraven Crinan jacket ($299); Silk hand-printed Nelli scarf ($135); Camo Helmet bag ($21); Bass Nikki boots in black and in tan and brown ($109). A feminist icon, not just a style icon! I have a helmet bag exactly like the one in the picture (except solid olive), and it's the greatest airplane carry-on ("personal item") ever. It's big enough to fit a normal-size purse, books, magazines, knitting, cameras, etc. It's slightly padded, so things don't get damaged or poke out of the cloth, and the small handle is the perfect size to loop around the handle of a rolling bag. how do you know she was the first? what about Lee Miller? There were a lot of women war correspondents in WW2. None in ww1, however. but i am curious how you chose her as the "first". do tell! Good question! What I do know is she is often credited as being the first foreign photographer permitted to take pictures of Soviet Industry, the first female war correspondent (and the first female permitted to work in combat zones) and the first female photographer for LIFE, where her photograph appeared on the first cover. I suppose Miller, another pioneer, came slightly later. It could be one of those things in history where it's blurry and she became the face of female war correspondents, or maybe it is indeed a hard fact. Just looked deeper into Miller's career and she didn't become an accredited war correspondent until December of 1942, whereas it seems Bourke-White was on assignment in the 1930s, even before the war broke out. Totally! I have one too and LOVE it! Great uniform post, as per usual! Great picture. Margaret Bourke-White wasn't the first female war correspondent though. She might have been the first American female war correspondent. Gerda Taro is credited for being both the first female war correspondent and the first female correspondent to die in a war. She was killed while covering the Spanish Civil War with her boyfriend Robert Capa.